1.3.1965 - 30.3.1972 Locked in our hearts you will always stay. Loved and remembered everyday. 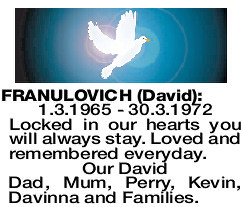 Our David Dad, Mum, Perry, Kevin, Davinna and Families.